Battling for line honours in the Royal Ocean Racing Club's Rolex Fastnet Race continued all the way to the Plymouth finish line last night in both the maxi-multihull and monohull divisions. Among the multihulls, Yann Guichard and Dona Bertarelli's 40m Spindrift 2, found herself locked in a match race with two time Route du Rhum winner Lionel Lemonchois' Multi 80 Prince de Bretagne, between the Traffic Separation Scheme (TSS) south of the Scilly Isles to the Lizard, before her sizeable waterline length advantage prevailed. The giant trimaran crossed the line at 22:57:41 BST in an elapsed time of 2 days 10 hours 57 minutes and 41 seconds, more than a day outside of her own record, set in the 2011 race. "It was a fantastic race, quite difficult from the start to the end," said Bertarelli. "The wind was quite light and not really made for this type of boat. We are the biggest, but we are also the heaviest. All day today we were neck and neck with Prince de Bretagne, which kept on coming back into us." Spindrift 2, the world's fastest offshore race boat, was only completely becalmed on one occasion as she was passing the TSS by the Scilly Isles in this generally ultra-light winds Rolex Fastnet Race. Bertarelli described it: "We had the gennaker glued to the mast and we didn't know where the wind was coming from and we could see Prince de Bretagne coming closer and closer. It was scary..."
Bertarelli, well known for her success racing on Lake Geneva, is used to chasing down zephyrs on the water, but according to Yann Guichard manoeuvring the giant Spindrift 2 is a different proposition to their nimble lake racer. Nonetheless there were occasions on this fickle race when they were forced to tack or gybe every 10 minutes. The final hours were most stressful as the wind was decidedly patchy off the Cornish coast and frequently they were becalmed when Prince de Bretagne was doing 14 knots, or vice versa. All that the Spindrift 2 crew could do was to try to cover, keeping herself between her rival and the mark, finally shaking off Prince de Bretagne at the Lizard. For the crew, the Rolex Fastnet Race was all good training and validation of Spindrift 2's latest modifications prior to her attempt this winter on the Jules Verne Trophy record, non-stop around the world. Ultimately it was not Prince de Bretagne, but Lloyd Thornburg's Phaedo³ that was second multihull to finish, having overtaken her rival just short of Rame Head, around five miles from the line. However the American MOD70 herself was then becalmed less than a mile from the line, allowing the French boat to close to within 0.3 miles. Finally Phaedo³ ghosted across the line finishing 20 minutes ahead of Lionel Lemonchois' Multi 80, which in turn had become stuck in no breeze. Thornburg was ecstatic after this, his first ever Rolex Fastnet Race. "This is the most exciting race I've ever done! Between leading everyone out of the Solent and then battling with Musandam-Oman Sail and then Prince de Bretagne all the way to the Rock and making a mistake in letting her by." In the breeze on the way up to the Rock, Phaedo³ was making 30 knots. "We wanted to get her [Prince de Bretagne] back, but we weren't certain we could. Then we saw her almost overtaking Spindrift and we thought she might get in first. Luckily they were racing each other which gave us a lane to come in and start catching up. "We were in sight of each other for most of the course. It was pretty amazing - a couple of hours ago we were still looking at Spindrift, the world's fastest boat and strategizing about how to get past her...." said Thornburg. Following the numerous records Phaedo³ has set in the Caribbean and her speedy Transatlantic Race last month, Thornburg observed that this Rolex Fastnet Race in comparison wasn't a high speed affair and they had experienced many soft moments, although "the finish was the only time we went backwards!" Musandam-Oman Sail, skippered by Sidney Gavignet, came home fourth on the water with Tony Lawson's Concise 10, skippered by Ned Collier Wakefield, reaching Plymouth in fifth having been pipped at the post on the water by the leading two maxi-monohulls. The MOCRA handicap prize for the multihulls remains up in the air. The monohull line honours battle was similar to the multihull one with a dominant boat, in this case Jim Clark and Kristy Hinze Clark's giant 100 footer Comanche, finding it tough to shake off a persistent opponent, in her case George David's Rambler 88. Ultimately their race went to the wire with Comanche arriving at the line off Plymouth Breakwater four and a half minutes ahead. "It was a classic finish to what will become a not-so-classic Rolex Fastnet Race," recounted Comanche skipper Ken Read. "It was honestly one of the most bizarre races I've ever been in in my life - starts and stops and people being left behind for dead and then all of a sudden they are sailing around you - it was phenomenal." The drama in both line honours races was heightened by the wind filling in from astern during the final 24 hours. "You can never leave Rambler for dead," continued Read. "We thought a few times in this race that we had them put away for good, but then they would come back in again." As a result Comanche ended up having to cover Rambler 88 from the Scillies on to the finish. "Our goal, as ever, is to be first to finish. So that was a success for Comanche." 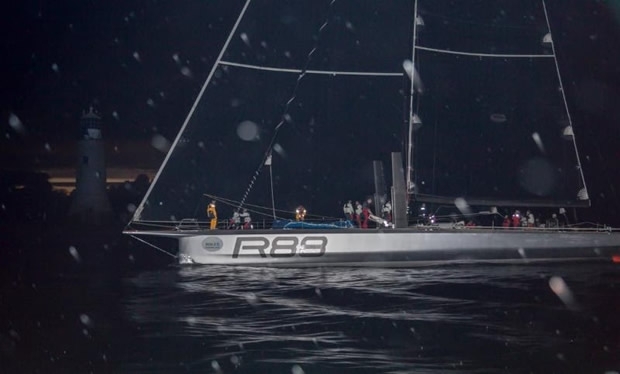 Rambler 88 owner George David was more than satisfied by the performance of his smaller boat against the mighty Comanche, finishing six hours ahead on corrected time under IRC. "Bear in mind that they owe us about 50 miles for this race, so to finish within a few minutes is remarkable. But we benefitted from their coming in here first. We saw the breeze was going light so we came in low with a good deal of pace on and they stopped. They were down to a knot and we thought we might go round them - with no success alas." For David this year's race was different from his last two, which were both heavy in 25 knot winds. In comparison, David said, "this was just placid all the way. It took us forever to get around the Rock. But coming down from there was a great sail, a beautiful day, 8-9 knots and it was nice coming up the Channel last night. We had a good time. The boat worked well and we had a good result." Pre-race, both Comanche and Rambler 88 were re-moded for light winds. Comanche sailed with four fewer crew than normal, whereas Rambler 88 shed just one but removed her radical side foils that David says typically turbo charge the boat's speed in 18+ knots of wind. They also raced with no spinnakers - all combining into a substantial reduction in their IRC rating. Like all of the maxi monohulls, Rambler 88 parked up at the Rock and David reckoned they travelled just 10 miles on the tide in five hours. In the race four years ago George David and his partner Wendy Touton came very close to losing their lives when their previous boat, Rambler 100, lost its keel shortly after rounding the Fastnet Rock. They and three other crew became separated from the upturned hull of their boat but shortly before dusk were eventually rescued. "We had a moment of silence at 5:40 in the afternoon on Monday, which would have been the time that we flipped over at the Rock. It was dramatic moment," said David sombrely. Comanche and Rambler 88's next dust up will be the Rolex Middle Sea Race in October. The two other big monohulls, Mike Slade's Farr 100 Leopard and German Dieter Schon's Maxi 72 Momo, put up a valiant fight against Comanche and Rambler, finishing respectably - Leopard just one hour behind Rambler 88 on corrected time in IRC Canting Keel, while Momo leads IRC Z. "This boat is eight years old now and I describe it as 'she's a got a bit middle-aged and put a little bit more weight on her than maybe she should have'. That's how we live and the boat fits into that pattern." With no Rán team this year and with Hap Fauth having to pull race favourite Bella Mente out of the competition at the last minute due to unexpected work commitments, Momo was the only Maxi 72 (Mini Maxi) in this year's race. She finished at 6:57:33 BST this morning, roughly one and a half hours after the substantially larger Comanche. While British Volvo Ocean Race winner Jules Salter was on board as navigator, Michele Ivaldi was also in the afterguard, the leading Italian tactician sailing his first ever Rolex Fastnet Race. "It was a long race, pretty tricky with a lot of critical points," said a tired looking Ivaldi upon his arrival this morning in torrential rain. "One of the best things was when we found ourselves on that first morning right behind Comanche and in front of Rambler. We stayed in more pressure all night and we managed to make the current gate." Ivaldi felt the only significant mistake they had made was to go northeast of the Scilly Isles en route to the Rock. "In hindsight it would have been better to stay outside, like Rambler did. They got nice pressure and caught up on Comanche a lot, so probably that was our only mistake." At the Fastnet Rock they had closed up significantly on the boats parked ahead of them. Ivaldi said they were held up at the Rock less than their larger rivals. "We lost three hours there, they lost four or five. Then we put a wind seeker on which we kept up staying on the same tack until two hours from the finish."